Every night, we’d wait for them. Enjoying the coolness of a northern Michigan evening, my fellow campers would quiet ourselves and wait for the deer to relinquish their hiding places and come to the river for water. It was a highlight of our day. The river shimmering in the setting sun seemed to welcome the approaching hush of the forest night. There would be slight movement, a quiet rustling and then timidly, the deer would free themselves from the lush foliage and approach the water’s edge. Once there, they would lower their heads down to the cold water and drink to their hearts content. Their actions brought Psalm 42:1 alive for me. 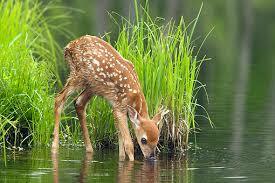 The deer fought back every fear of exposure to come to the river and drink their fill. How I long to crave God the same way they craved those unhurried sips of water! King David wrote in the book of Psalms, “My God I want to do what you want” and “What I want most of all and at all times is to honor your laws” (Psalm 40:8, Psalm 199:20). When you still yourself much like my fellow campers did to watch the deer in the glooming, you are going to hear from God. That’s because while many people talk to God, but they never hear from God. They make prayer a monologue. You can’t have a relationship with God when it is so one-sided. Relationship only happens through conversation. You talk, then you listen. Just as important as talking to God in prayer is listening to God. You have to still yourself to heard His words. And in order to do that, you’ve got to want it so badly your heart pants for a word from Him. This entry was posted in Improving Every Day Living, Improving Relationship, Joy and tagged contentment, encouragement, friendships, God's love, grace, Joy, presence of God, purpose, vacation on December 2, 2016 by Myra Wells. There are so many reminders of God’s love around us. During that week, all of us learned how to settle ourselves and crave God simply by watching the deer come down to the river in the evening. Have a blessed Christmas season. Beautiful comparison! And yes, we must remain thirsty for God, as only He can satisfy. I admit I sometimes fall into the habit of monologue rather than remembering that it is a true relationship with God that I seek. May you have moments of quiet solitude in which to hear from the Heavenly Father. Thanks for your comment. You are so correct when you say only God can satisfy. We only need turn into him. Have a lovely holiday season craving the miracle of his love brought down to earth.